Instructions: Card size is 6 1/4 x 6 1/2". See the Center Step Card tutorial from Splitcoaststampers here. https://www.splitcoaststampers.com/resources/tutorials/centerstepcard/. I just changed the measurements to fit my card. Cut white cardstock to 11 x 6". Line cardstock up in paper trimmer so that the edge of the card is at the 3/4" mark. Position the cutting blade at 3/4" and cut from 3/4" to 6 1/4". Line cardstock up in paper trimmer again so that the edge of the card is at the 1" mark. Position the cutting blade at 3/4" and cut from 3/4" to 6/1/4". Flip card over and do the same on the other side. Use the scissor or the paper trimmer to cut out the 1/4" strip. Place cardstock onto scoring tool and score along the long side of the card from the edge to the cut line at 3/4", 1 1/2" and 6 1/4". Flip card over and do the same on the other side. Score between cut lines at 5 1/2". Make the folds following the tutorial. Using the fourth largest die from the Eyelet Rectangle and Basics Die, diecut white cardstock. Using the same die, diecut the designer paper. Adhere these together using dries clear adhesive and adhere to the center of the step card. Diecut a stitched border from white cardstock using the two large dies from the Hand-stitched Accents Die set and adhere as shown. Using the Tickets and Tags Die set, diecut the long eyelet die four times from white cardstock. Use the long plain die to diecut the designer paper three times. Ink the edges of the designer paper strips and adhere to the eyelet diecuts. Adhere one to the bottom of the step card as shown. Trim the other two to 5" and adhere to the two sides of the card. Trim the fourth eyelet diecut to 3 1/4" and adhere to the card base as shown. Stamp the sentiment from Celebrate Love Sentiments on white cardstock using Cobalt Blue Ink. Diecut using the long plain die from the Tickets and Tags Die, trim to fit the eyelet diecut and adhere using dimensional tape. Stamp the buttons on white cardstock using and Cobalt ink, diecut using the coordinating die and spray with Sparkle Sheer Shimmer Spritz. Stamp the yellow blooms on yellow cardstock using Archival Sunflower ink. Diecut using the coordinating die and shape using the Deluxe Flower Shaping Kit. Use two petals for each flower except for the small flower on the sentiment. 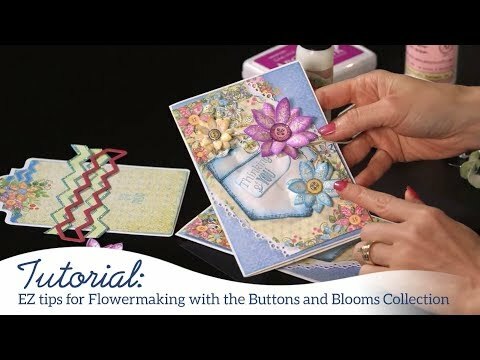 Add the diecut buttons to the flower centers using dimensional dots. Spray the flowers with Sparkle Sheer Shimmer Spritz and let dry. 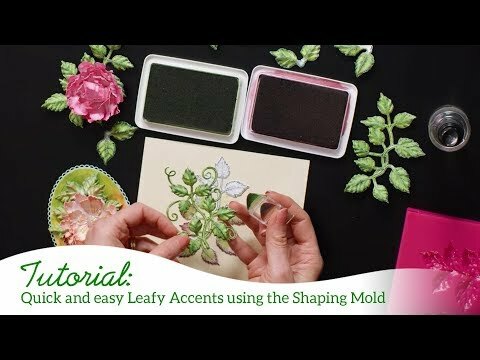 Stamp the Leafy Accents leaves on white cardstock using Archival Olive ink, color with the same ink and a little Berrylicious ink, diecut using the coordinating dies and shape using the Leafy Accents Mold. Spray with Sparkle Sheer Shimmer Spritz and let dry. Sponge with dries clear adhesive and sprinkle with Rajni Chawla's Crystal Clear glitter.